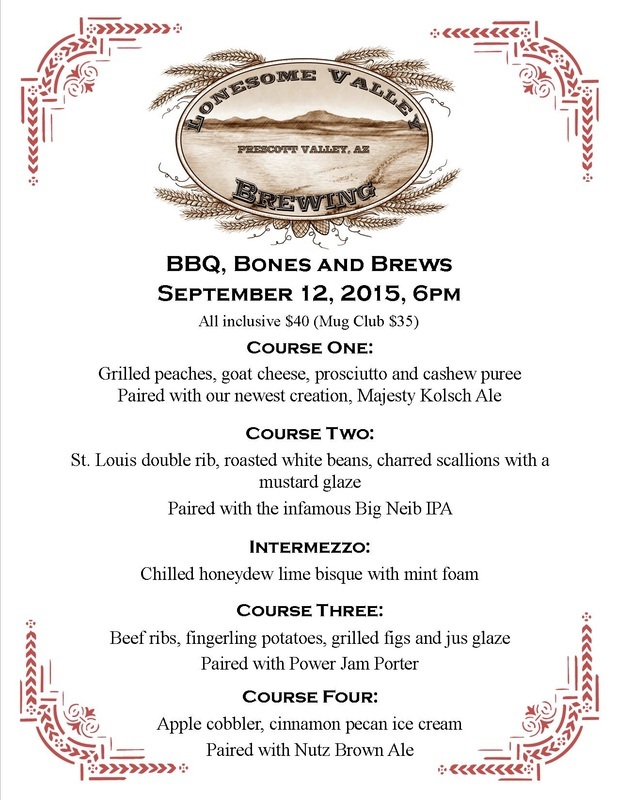 Prescott Valley, AZ – Locally owned Lonesome Valley Brewing (LVB) will hosting BBQ, Bones and Brews, a summertime beer pairing dinner on Saturday, September 12, 2015. The brew pub will close to the public at 5pm to prepare for the 6pm dinner. Based on the tremendous success of our Father's Day beer pairing, This dinner will again be a departure from the brew pubs typically casual atmosphere. The four courses and light intermezo have been designed to complement four of the brew pubs craft beers: Majesty Kolsh, Big Neib IPA, Power Jam Porter, and Nutz Brown Ale. This all inclusive dinner will be $40 per person or $35 for our Mug Club members. Please call Lonesome Valley Brewing at 928-515-3541 in advance for reservations as space is limited. This event's menu is a tribute to hearty summer food with a flare of fine dining brought to you by the LVB dream team, Brian Bellem and Joseph Alson.